And so we continue with our cruise recap. When last we left off, we had boarded our cruise ship in Barcelona. The next day was an "at sea" day, and we explored the ship, enjoying the food, drinks, and kids clubs. The next day's schedule called for a stop in Tunis, Tunisia. I was excited to get my first glimpse of Africa, although due to military personnel restrictions we weren't able to get off the ship. But early in the morning they made the announcement that due to high winds, it wasn't safe to dock and the ship would be skipping the port. We weren't super disappointed since we had no plans to get off the ship, but a lot of the other folks were let down. When they made the announcement, the seas were seemingly calm. Fast forward another hour and the wind started to pick up, and the boat started rockin'. I've experienced a few rough sea days on cruises, but this was by far the worst. Since I have a slight tendency to motion sickness, I spent the afternoon in my bed. Horizontal felt much better, and I was able to nap away the hours of rough seas. Josh, fighter pilot with stomach like tank, had taken the kids to the club and then went down to reception to pick up some anti-nausea medicine for me. When he came to deliver it, he told me that I should not go out there. It was like a zombie apocolypse. Seasick people were everywhere, looking half dead on their feet and vomiting with reckless abandon. He said they were all laid out on the floor in the reception area, moaning and groaning. I think we needed a few ground rules. 1) If you are an adult, and you are feeling nauseus, STAY IN YOUR ROOM. You know, near your toilet. 2) If you are an adult, and you are feeling nauseas, and you have no other recourse than to leave your room for whatever the reason may be, BRING SOMETHING WITH YOU WITH WHICH TO CATCH YOUR BODILY FLUIDS. Nobody wants to see that. Or hear that. Or smell that. We felt so bad for the crew that day, having to work with the ship pitching back and forth, and having to clean up after humans acting like animals. Josh went up to the kids' club to check on Alex & Derek. Eight of the 12 kids in Alex's room had vomited, including her. She wasn't feeling very seasick, but it turns out when 7 other kids are puking all around you it becomes somewhat hard to avoid it. Josh brought them back to the other cabin (we had 2) and they watched a movie while I napped. When I woke up the seas were much calmer and we were able to enjoy the evening despite the rough day. 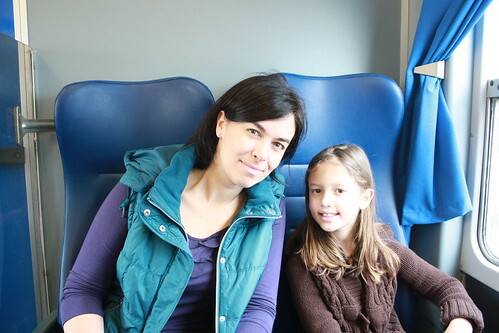 The next morning, we got off the ship in the port of Civitavecchia, which is about a 45-minute train ride from Rome. 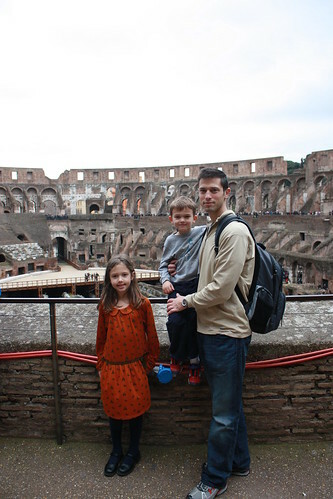 We tried to be fairly adventurous and explore on our own at the ports versus pay the high prices for the ship excursions. I did a lot of research beforehand on how to get around. We found public transportation in Italy to be much less user-friendly than France, but both countries had many more English speakers than what we experience in Spain. 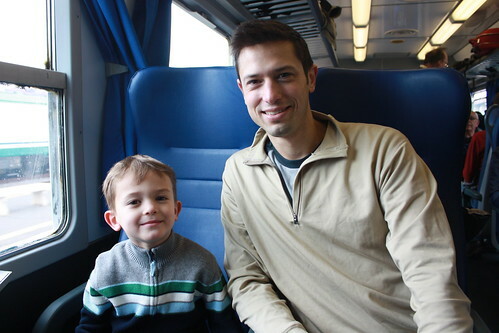 Here we are riding a train through the Italian countryside. 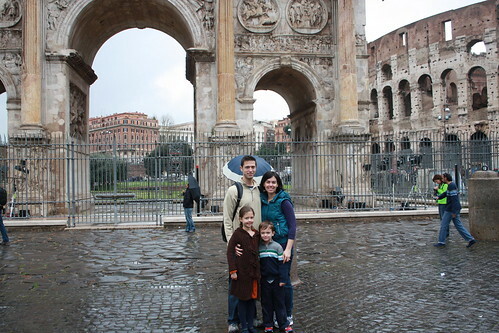 Rome was the the place we were probably the most excited to see. Alex and I had studied it quite a bit in our homeschooling time, so even she was interested to see some of the things we'd learned about. Unfortunately, it rained on our parade. 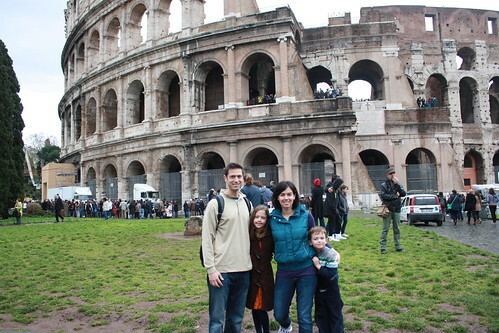 The first thing we did when we arrived was see the Colosseum, which we all enjoyed. It was still dry at that point in time. It was a bit surreal to be inside of something so old. To know that from where we were standing, people watched as gladiators fought to the death, and Christians were fed to the lions for the crime of confessing Christ. We had a good talk about how far we as humans can go in the name of entertainment and doing what seems right to ourselves with no outside frame of reference. Seven and five are just about the right ages for a lighthearted discussion on the depravity of mankind, no? It started to come down fairly hard, so we ducked into a restaurant and had some overpriced pasta and pizza. ...And we came to the realization that no matter what we had hoped to see, when you're cold and wet it's just not fun. 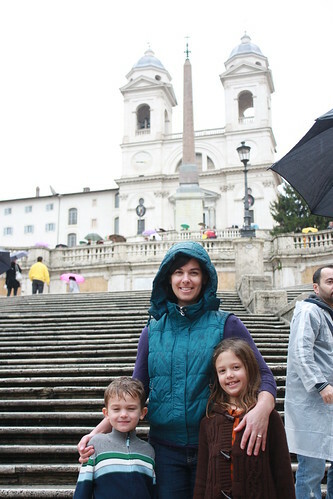 We managed to find the Trevi fountain and snap a quick picture by the Spanish steps. We were smiling in that last one because we could see the metro stop and knew we'd be on a dry train soon. It was a little disappointing, but at least we weren't being fed to the lions. Our next day was a definite improvement. Next up, Pisa! Oh dear, your ship experience...I agree with you 100%! Why on earth would you go out on deck (or whatever) if you are feeling so sick?! It is so amazing what you guys are getting to do and see!! Michaela has asked if we can visit Pompeii! haha-That's what we get for homeschooling. :) That would be a pretty pricey field trip. Not that I needed it, but your post just further confirms my 'no cruise' rule. 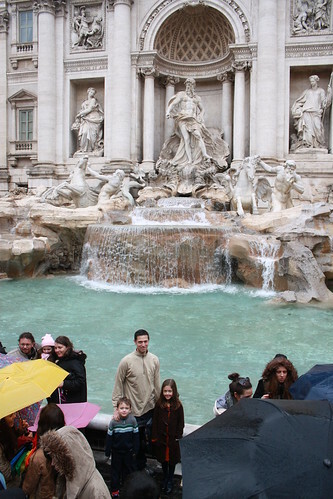 Sorry it rained in Rome...a bummer! But I am still jealous.